Named after a series of barbers resided in the house of Latrán No. 1. There used to be a gate at each side of the bridge. The inner gate was demolished in outer gate was demolished during 1842-1844, while the outer gate was demolished in 1860, both because of their bad conditions. 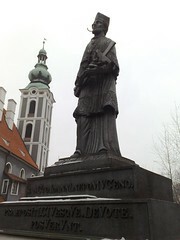 On the bridge, a statue of St. Jan Nepomucký, a national saint of the Czech Republic, is standing. Nepomucký was drowned in Vltava River, after refusing a request of the king of that time, which was to divulge the secrets of the confessional of the queen. 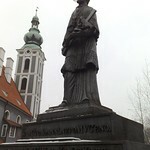 His statue is often seen on a bridge, because of the manner of his death, he is seen as a protector from floods.